In the world of EDM an entire album from one artist is a rare feat. Usually we get annual EPs spread throughout the year. But Datsik is changing the game. Known previously for the tracks ‘Firepower’, ‘Pick Your Poison’, and his countless remixes, he quickly rose to the top. This was all due to his excessive touring and hard work ethic. All of that dedication has led him to this, ‘Vitamin D’. This album shows off his talent for producing some outstanding bangers, but he also ventures out of his comfort zone with some really interesting tracks. The record also shows Datsik stepping up his prodcution value as well. The music is crisp and has a unique feel to it. This is a great way to start an album, it grabbed my attention and made me want to listen to the rest of the record. The synths are a lot darker than some of the other tracks, but combined with the grimy bass it makes a great banger. The random vocal samples spread throughout the song will cue you for when the bass hits hard. It’s also a great introduction to people who have never heard Datsik before. In this track he shows his love for rap. It features Snak the Ripper, whose unique vocals colour the song. It has a great vibe and once Snak says “Everybody don’t stop till somebody call the cops” you’ll be thrashing around. The drop is heavy and adds to the overall hip-hop vibe. After a couple of listens you’ll be singing every word with anticipation. This is one of the standout songs on the entire album. ‘Syndrome’ starts out with some classical strings and slowly transitions into some heart-convulsing bass. It’s an interesting and unique mix of genres that wouldn’t seem to work together. Both artists do a great job combining each others’ sound. Downlink‘s signature bass in present here and Datsik‘s attention to detail shine through. This is one of the best produced dubstep tracks this year. This song gives me the feeling the title is named after him. Datsik is for sure an EDM Hustler. He has worked hard to make a name and a brand of sound. You’ll never hear grime sound this good. This is by far the most experimental track on the album, and what a great experiment it is. Infected Mushroom keeps their psychedelic style while Datsik layers on top some of the heaviest bass I’ve ever heard. Jonathan Davis does a great job with expressing emotion in his voice. This track feels like an old school Korn track with a lot more bass added. This track has a lot of old school video game sounds spread through out it. I enjoy the beat and drops but I did not enjoy the vocals at all. The singer tries to hit higher notes but it sounds awful. This is a track to avoid. The intro is a melody of relaxed syths, establishing a “playful” sound. Then it transitions into a sample taken from Shakedown’s 2002 hit “All Night.” The sample is a great way to start the drop, which is heavy and distorted. Overall an interesting pairing. Light the fuse had me bouncing from start to finish. The synth pattern and drum kick has a light feel to it. The drop keeps the playful sounds and adds Datsik’s signature dirty bass. Another stand out track! This track is dark, futuristic, and a straight up banger. I had this on repeat for while. 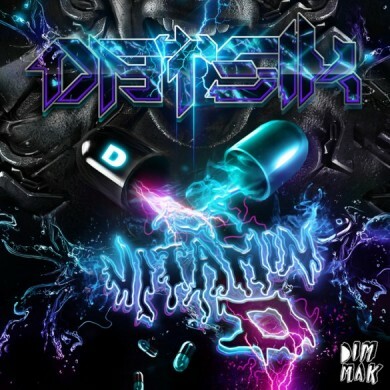 Datsik takes control of the listener for the duration, the song is hypnotic. The build up is a little anti-climatic but the drop will keep you listening. Both artists do a great job at combining their styles into a slow paced banger that will have you ready for more. This is my favorite track on the album. It has a great opening, which kinda resembles Skrillex’s track ‘First of the Year’. It features catchy rap vocals by Messinian, whose voice is deep and will have you hooked once you hear it. When the drop happens the listener is bombarded with bass. This is one of Datsik’s best songs yet. This is an excellent way to close out an album. The song is full of energy and his signature bass. The song does what every album closer should, wanting you to hit replay. Datsik has made an album every fan of Dubstep can appreciate. He steps out of his comfort zone for varied results. He took risks, and most paid off, and I respect him all the more for it. This is one of the best albums in the genre this year.